Paul Fairbrass and Cliff Dale, both 65, were supposed to go on a trip with their best friend Ron Hopper but he tragically died of cancer. So, the two best anglers decided the best way to honour their late fisherman friend was to turn his ashes into bait for a "legendary catch". Keen fisherman Mr. Hopper, 64, from Hull, East Yorkshire, was given just weeks to live after being diagnosed with an aggressive liver cancer in December. The trio, all from Hull, went fishing in Thailand last year as a retirement holiday and had booked a return this April. But, sadly the former marine engineer lost his battle with cancer on December 22 and was cremated three weeks later. According to Mr. Fairbrass and Mr. Dale, their deceased friend told them on his deathbed that he wanted them to use his ashes as fish bait. 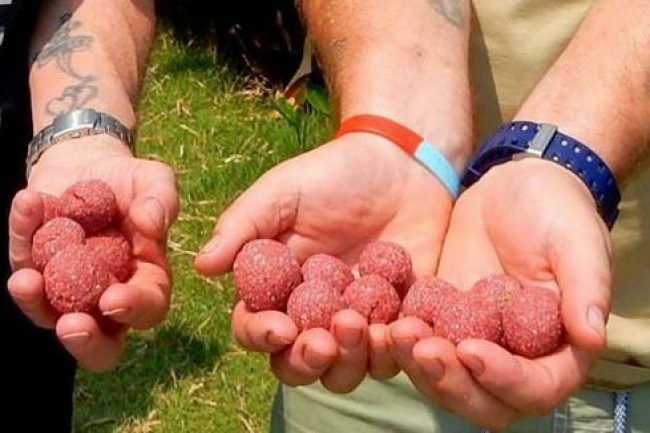 He said if he couldn't go to Thailand himself then his two friends should take his ashes to the Far East with them and infuse them with a special bait mix to make "boilies". While his widow Judith scattered half of his ashes on a beach in Grenada, the two best friends were given responsibility for the other half. The two fishermen named the special bait 'Purple Ronnie' and cast off with it on the end of their lines throughout the nine-day trip. Mr. Fairbrass said: “A few days before he died he asked us to take his ashes to Thailand and scatter them around the lake. “I told him we would go one better than that and turn him into boilies and catch a big fish with them. "He just cracked up and said it was a brilliant idea." 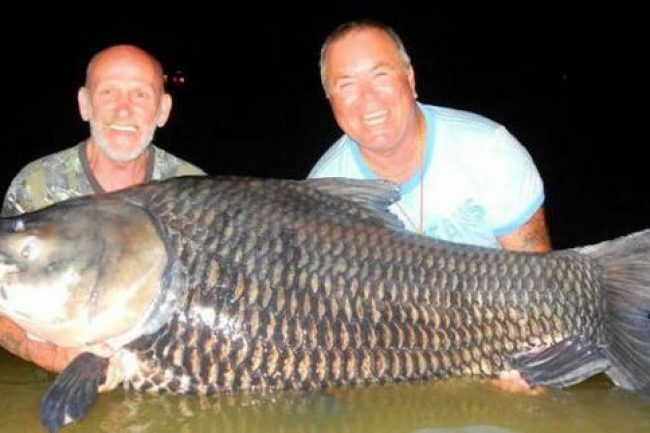 The unusual blended bait was so powerful it even helped the two snare a whopping 12stone Siamese carp - one of the biggest carp fish ever caught in the world. 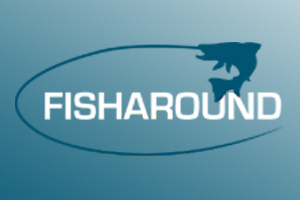 Mr. Fairbrass said: "We were gutted that Ron couldn't come on the trip because he was really looking forward to it, but he was definitely with us when we caught that fish. "We caught some smaller fish with it but didn't think we would get a big one. Ron must have been looking out for us." “It seemed like it was destiny we would use Ronnie to catch one of the biggest fish in the lake. Mr. Dale added: "I am not a religious person but it felt spiritual, it felt like Ron was there with us. Eddie Mounce, of the Jurassic Mountain Resort which organised the fishing trip, said: "The memory of Ron will live with us here. "Ron may not have been with us in person this year but he certainly was in spirit. He made sure the fish gods where smiling down and gave Paul and Cliff the catch of a lifetime. "The three men are now part of Thai fishing legend." 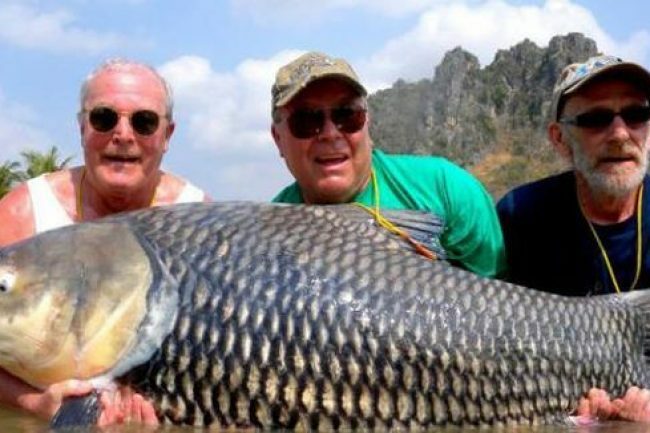 The world record for a Siamese carp is 134lbs but the International Game Fishing Association stopped listing them since they swim in protected waters. The fish Mr. Fairbrass and Mr. Dale caught weighed an incredible 180lbs.